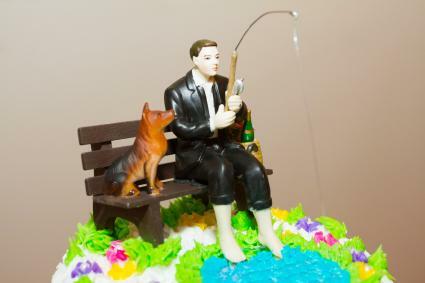 Whether it's for a retirement, birthday, anniversary, or even a wedding, a cake featuring your favorite fisherman's pastime is sure to bring smiles to all. Feature his favorite species or pick one with a silly take. No matter what you choose, you'll need to put on personalized touches to make it your own. 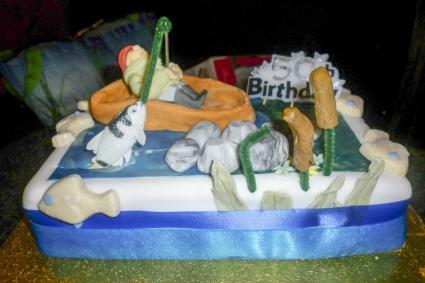 A cake featuring the main species he likes to fish is the perfect cake for any fisher worth his bait. Even those beginning with fondant can make a marbled river to cover their main cake. Add gum paste or marzipan pebbles with lightly twisted green fondant strips for the algae. Customize the fish on top by making it trout, bass, walleye, perch, or another type of favorite fish. Larger fish can be made out of crispy rice treats and covered in fondant. Shape scales and use airbrushing techniques to create a realistic look to celebrate a big catch. Let the fisherman in your life know it's okay to kick back and relax with this fun birthday design. It starts with a fondant covered cake that utilizes an edible image for the lake. Marbled fondant rocks help set the scene along with some candy fish and ribbon around the edges. Shape the fishing boat out of modeling chocolate. Replicate your favorite fisherman by making a fondant person and adding personalized accessories and accents, such as a favorite hat or beard stubble, until you create the right look. You don't need to be able to replicate your favorite lake to create a good cake. Start with a cake covered in buttercream frosting. Add a small blue buttercream pond surrounded by greenery and accented using a drop flower piping technique. Make sure the pond is not centered; you'll need to leave room for the figurine toppers. The fisherman topper can be a simple gentleman having a leisurely fishing day or he could be decked out in full fishing gear; it's up to you how to depict the person you're celebrating. Make sure you match the dog breed too for optimal personalization. Not all cakes need to depict sunny summer weather. 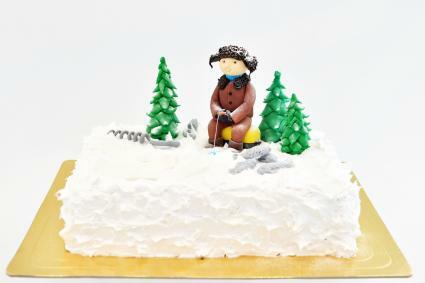 Instead, celebrate the ice fisherman in your life with a cake geared toward him or her. Start with a buttercream-frosted cake and use your spatula to create wispy divots that resemble a snow-covered lake. Shape trees, fisherman, tools, and fish out of fondant. A light dusting of powdered sugar creates a realistic snowy scene. The fisherman who appreciates humor will get a kick out of becoming shark bait while fishing on top of this silly cake. 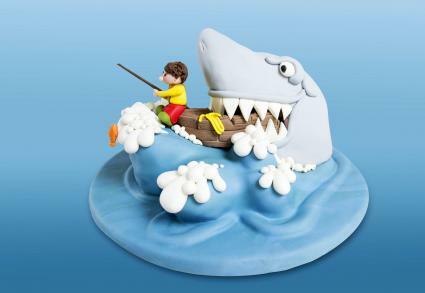 The fun novelty cake is shaped to look like a large swell below the fishing boat, with a fondant shark head coming off one side. Carving skills are needed for this cake, but it's worth the effort. Make the figures out of fondant or even gum paste and allow them to dry before placing in the fondant boat. Customize by swapping the shark for an octopus or another sea monster to creep up on the unaware fisherman. The Gone Fishing cake by Flourish Cakes is another take on an ice fishing theme. Ombre blue water hosts shaped fish while a fisherman sits near the opening in the top. Large buttercream trees finish the cake. This cake features a giant fish busting out of the side of the lake (and cake!). Plan to spend the most time making the fish so it looks as realistic as possible. A simple fisherman on top, along with algae, pebbles and a "No Fishing" sign add final touches so the fish stays front and center. 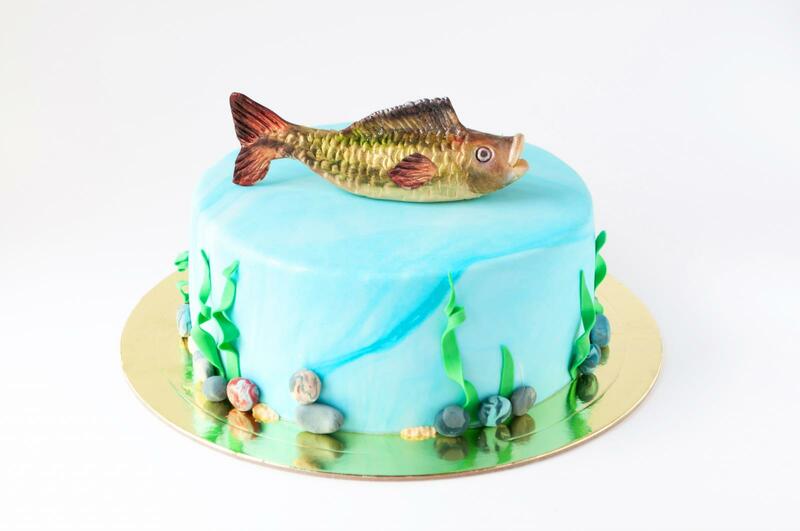 Someone who enjoys life in the great outdoors will love a fishing themed cake. Pick a design you like and personalize it to suit whoever you're celebrating.